Enter the PVD Airport parking property from the highway exit or using Airport Connector Road off of Post Road. Then, follow the signs for “Arrivals” and take a right at the light to go through the arrivals tunnel. Please make sure you are using the entrance on T.F. Green Airport Connector Road, our Post Road entrance is currently closed. You can drop off your group in the “Arrivals” tunnel. They will be able to wait in the center of the terminal for you or head up to the second level to get in line for TSA. After dropping off, continue straight around the circle and Red Beam Garage C will be on your right. Drive up to our Rhode Island Airport parking attendant and they will check you in with your reservation. If you do not have a reservation, they will provide you with a ticket upon entry. Please note, making a reservation does guarantee a space within the garage. If we are at capacity, only travelers with a reservation are guaranteed a space. We also cannot guarantee specific spaces to customers. They are first come, first served. This includes handicap spaces and covered spaces. Be sure to make a reservation before entering the garage, either ont the website or on the mobile app. We cannot take reservations over the phone. 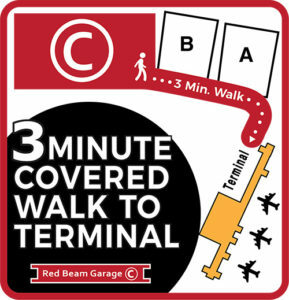 Our PVD Airport parking facility is just a short, 3-minute, covered walk to the terminal. Follow the map above or the signage for the terminal in the walkway through Garages A and B. Please make sure to check out of FAQ page before your trip.